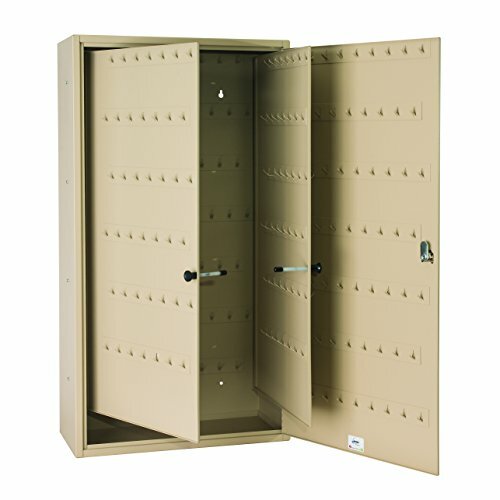 This sturdy key cabinet from Steel master is constructed of steel and coated with a scratch and chip resistant finish. With a capacity to hold up to 310 keys, the fob-friendly cabinet design accommodates larger key fobs. The wider spacing between hook rows means less tangling, plus there is additional space in the bottom of the cabinet for increased storage. Serving the retail, specialty, hospitality, and banking Industries, Steel master products are built to perform and made to last. Each Steel master product is constructed of sturdy, heavy gauge material that is designed to stand up to daily use.